Just about a 15 minute drive away is the fascinating town of Cobh, County Cork. It was known in earlier times as Queenstown, then as Cove. The spelling was then changed to the Irish Cobh (‘bh’ in Irish sounds like ‘V’), so pronunciation remained unchanged. This seaport on the southern coast of Ireland features large in the history of our nation. 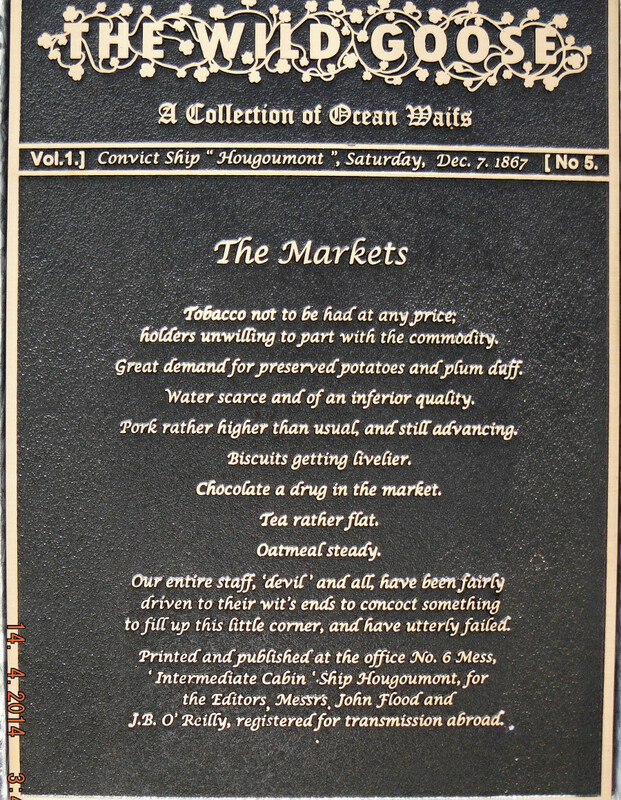 Sitting on what is one of the world’s finest natural harbours, Cobh has witnessed the emigration of millions of Irish whether by transportation to penal colonies, or in search of a better life in the New World. It is a poignant place, where so many of our people last stood on their home soil. My uncle was one of these who left for America from here and the sight of Cobh as they pulled out to sea stayed with him as a sad and tearful memory for decades. Cobh has also figured large in maritime history. Nearby is Haulbowline the base for the Irish Navy and Spike Island with its 18th century star-shaped fort and a former prison. The beautiful cathedral church of the Diocese of Cloyne stands over the town. Designed by Pugin and opened in 1879, St Colman’s is on the site of the old Bridwell. This beautiful building dominates everything around. The spire was added to the structure later and completed in 1915. The largest Carillon in Ireland and Britain comprising 49 bells is here and following restoration it is now considered one of the best in the world. Cast in Loughborough, England and weighing some 25 tons, the bronze bells were transported from Liverpool to Cobh by courtesy of the British Navy, as no civilian vessels could make such a delivery during World War 1. The bells are not rung with ropes but are played with a keyboard with pedals that move the clappers. I was here at 4 pm which is one of the times when the hour chimes are followed by a tune. It was quite an experience to hear them ring out over the harbour! Cobh has very steep little lanes leading down to the water’s edge,with colourful houses and quite a nice assortment of buildings. Way below the imposing spire at the water’s edge is a delightful park, known locally as The Prom. Restored and upgraded several times, it was constructed in 1805 and renamed Kennedy Memorial Park in the 1980s. I am not sure what connection JFK had with the town. Pleasant views of activity in the harbour. Memorial to Robert Forde Antarctic explorer who served with Scott on the Terra Nova. But Cobh is associated with another major maritime tragedy. On 7 May 1915, 101 years ago tomorrow, the Cunard liner RMS Lusitania sailing from New York to Liverpool was torpedoed by a German U Boat, off the County Cork coast with the loss of 1,198 lives. Although she sank within 18 minutes of being hit, 761 passengers survived. This incident is considered to be the catalyst for the entry of the USA into the war. In Cobh there is a fine monument commemorating the tragedy where many of the survivors and the dead came ashore. The monument in the main street is directly in front of the building which was used as a morgue for the dead in 1915. 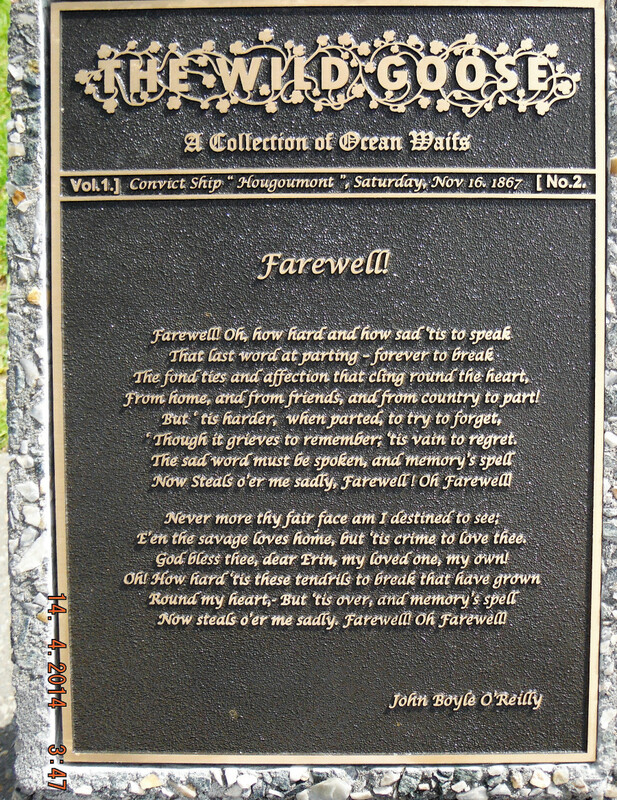 In the Kennedy Memorial Park there is a wall in remembrance of the survivors of the disaster. 194 of the Lusitania victims rest in three mass graves and 24 individual plots at the local cemetery. The mass graves contain 23 bodies, 52 bodies and 69 bodies respectively, with names of those buried there carved on 3 glass memorials. These sad memorials are in the very historic graveyard that bears witness to a number of tragedies at sea, with many sailors resting here. It is worthy of a visit to experience some of the history and to marvel at some of the stonemasons craft. Back in the town, one of the most famous sculptures is dedicated to Annie Moore and her brothers who sailed from Cobh to join their parents in New York. Annie was the first person to pass through Ellis Island. Cobh is a town that has so much to offer that it would take a number of visits to cover it all. I am fortunate that it is almost in my backyard, so I will be there on a regular basis, to explore its beauty and other aspects of the fascinating history of the place. A Mayo village devastated by the Titanic disaster. April 11 1912. Titanic sails from Queenstown. April 14 1912. Iceberg Ahead! Goodbye all! For the past two days I have reposted blogs written to commemorate the first two days of evictions of families from Derryveagh County Donegal in April 1861. Today I repost the last in the series,looking at events on 10 April 1861. ”By two, Wednesday afternoon, the terrible work had been accomplished and a deathly silence fell over the whole area”. This third post in the series marking the 150th anniversary of the Derryveagh evictions looks at the fate of the dispossessed. A Derryveagh Family – From an article by Paul J Mc Geady, Donegal Genealogy Resources. The names of these people and the townlands where they lived, live on in lists. Unfortunately as there are differences in family names and numbers in particular townlands, it is hard to know which list is the definitive one. However, at the end of this post, I have included the names of the families and the townlands, according to one such list, from the Londonderry Standard. So what became of these unfortunate families? Where did they end up? Records from the Workhouse in Letterkenny list the people who went there and provide information on their occupations, their townland of origin and their date of entry. Many of these would have left the workhouse when their prospects changed – if work became available, to go to live with relatives, or perhaps to emigrate. Others who had been offered temporary shelter, in Cloughaneely for example, may well have stayed in the area, as perhaps would those who found shelter with relatives and friends. May McClintock suggests in her publication that many may have indeed stayed in the general area, around Creeslough, Glendowan and Churchill. A third tranche, mostly younger people, and many probably children of the people evicted, took advantage of the Donegal Relief Committee Fund and availed of assisted passage to Australia. The Donegal Relief Fund had been set up in Australia in 1858 for the assistance of people from Donegal who were in dire circumstances. The geography of the county in the bleak and cold north-west with its barren, mountainous terrain, together with the decision by land owners to end the practice of allowing tenants to graze their sheep on the upper slopes in summer, gave rise to an annual famine lasting about three months. Following supplications from the local clergy in Donegal, the Donegal Relief Committee in Australia raised funds to help with immigration. The relief fund appears to have operated from 1858 when large numbers of people from Gweedore, Cloughaneely and Tory Island availed of the opportunity for a new life ‘down under’. Following the Derryveagh evictions, new pleas for help were made by the local clergy with the result that many young people had an opportunity to leave for a new life in Australia. And so in January 1862, 143 persons from Derryveagh joined 130 Gweedore people who departed Plymouth on a sea voyage of 3 months or more. That more family members left Ireland is a certainty. England and Scotland were close to home and were accessible relatively cheaply. 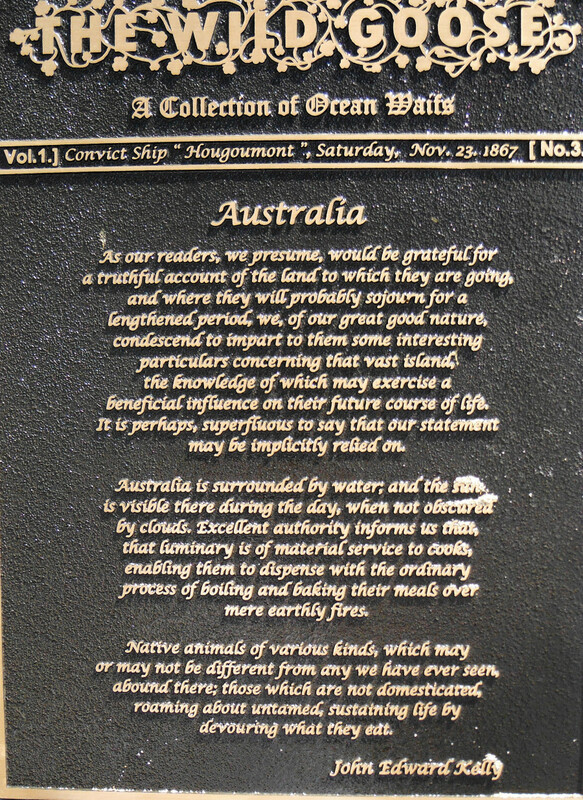 It is known that many went to Australia, some ended up in New Zealand and a number also went to America. The nature of the records at the time – where addresses recorded on ships lists often state the county of origin and not the townland, together with the preponderance of similar family and first names provide a challenge for researchers. One researcher in particular stands out in the telling of the story and tracing of the families of Derryveagh. She is Lindel Buckley, a direct descendant of a family from Glendowan. Her great great grandmother who lived in Stramore, just to the south west of Altnadogue, and whose sister had married a Sweeney from Derryveagh, emigrated to New Zealand in the 1860s. Lindel has located and transcribed hundreds of historical records from Donegal and of relevance to Donegal, and has made them available without charge on her website Donegal Genealogy Resources. Her extraordinary compilation has been and continues to be an inspiration to many. Through her work and her enthusiasm, she is one of the people who keep the Derryveagh story alive. A new book, written by local school teacher Christy Gillespie and his pupils, documents the personal stories of the people who were evicted in Derryveagh and was launched last Saturday by the Australian Ambassador to Ireland, Bruce Davis and the local historian May McClintock. Aptly named “A Deathly Silence” this new book will hopefully interest a new generation and give new insights into the people who are the key figures in this story,the people of Derryveagh. Hanna M’Award (Widow) and 7 children. – evicted and house levelled. Joseph M’Cormack, wife and 5 children – restored to possession as caretaker. Hugh Sweeney ( Widower) and 2 sons – evicted and house locked. James Sweeney, wife and 8 children- evicted and house locked. Owen Sweeney, wife, mother and 8 children – evicted and house locked. James M’Monagle, wife and 6 children- readmitted as tenant until November. John Brady, wife and 5 children- readmitted as weekly tenant. Francis Bradley, wife and 5 children -readmitted as weekly tenant. Patrick Bradley, wife and 4 children -evicted and house levelled. John and Fanny Bradley, a brother and sister, both deaf and dumb – allowed to retain possession. Roger O’Flanigan, wife, brother, mother and 4 children- evicted and house levelled. James Gallagher, wife and 7 children – evicted and house levelled. Daniel Friel, wife, mother, brother, and 1 child- evicted. William M’Award, wife and 2 children- evicted and house levelled. James Doherty, wife and 1 child- evicted and house levelled. James Lawn, wife and 9 children – readmitted as tenant until November. John Bradley, wife and 3 children – evicted and house levelled. Michael Bradley, wife and 4 children – evicted and house levelled. Catherine Conaghan (Widow), sister in law, brother in law, and 2 children – evicted and house levelled. Edward Coyle,wife and 1 child – evicted and house levelled. Knocker Friel, wife and 6 children – evicted and house levelled. Knocker Kelly and two servants – evicted and house levelled. William Armstrong (Widower), and 3 children-evicted and house levelled. Rose Dermot, Orphan – evicted and house levelled. Daniel M’Award, wife and 6 children- evicted and house levelled. Charles Doohan, wife, son and 2 grandchildren – evicted and house levelled. William Doohan, wife and 4 children- evicted and house levelled. John Doohan, wife and 5 children -evicted and house levelled. Connell Doohan, wife – retained as weekly tenants. Patrick Curran, wife and 5 children – evicted and house levelled. Mary M’Award (Widow) and 3 children -evicted and house levelled. Bryan Doherty (Widower), mother, sister and 1 child – evicted and house levelled. Hugh Coll, wife and 4 children – evicted and house levelled. Patrick Devenney, wife and 2 children -evicted and house levelled. John Friel, wife and 2 children – evicted and house levelled. Michael Friel and 1 child – evicted and house levelled. Robert Burke, wife – evicted and house levelled. Charles Callaghan- evicted and house levelled. John Moore, wife and 2 children – evicted and house levelled. Manus Rodden, brother and two sisters – orphans- evicted and house levelled. Bernard Callaghan, mother and brother – evicted and house levelled. Edward Sweeney and 3 children – evicted and house levelled. Daniel Doherty, wife, father and 2 children -evicted and house levelled. Bryan Doherty, wife and 4 children-evicted and house levelled. – From the Londonderry Standard, Glenveagh, April 10th 1861. Dolan, Liam. 1980. Land War and Eviction in Derryveagh, 1840- 65. Annaverna Press. Yesterday on 8 April I reposted a blog commemorating the 1st day of evictions from Derryveagh County Donegal on this day in 1861. This post, Derryveagh Evictions 1: Shattered homes, shattered lives, can be seen here. Today I the continue the series with the events of day 2 of the evictions on 9 April 1861. On April 9th 1861, the second day of the Derryveagh Evictions, the Deputy Sheriff and his 200 men, armed with battering rams and crowbars made their way through the townlands of Derryveagh. Their purpose was to clear the land of men, women and children to make way for the flocks of sheep that landlord John George Adair had imported from Scotland. Convinced that one of his stewards had been murdered by his tenants, and vexed that the murderers had not been identified by police, he set in train a legal process to evict all of them from his lands. The townlands of Derryveagh where the evictions took place. Click to enlarge. Compiled from Historic and OSI maps – With many thanks to Sara Nylund. According to the official report, 37 Husbands, 35 Wives, 159 Children and 13 ‘Other Inmates’ were evicted – a total of 244 people. Of these, 31 people, representing 4 families, were readmitted into possession as tenants, and a further 28 people, representing 6 families, were readmitted into possession as caretakers. These numbers include children. Eventually however, only 3 of these families were permanently reinstated, the rest were removed in the months after the main evictions. In Derryveagh, on those 3 terrible days, 28 of the 46 houses were either levelled or had the roof removed. Accounts of the evictions and the effects on the families concerned make for harrowing reading. The first house to be levelled was that of a 60-year-old widow, Hanna Ward (Award), her 6 daughters and one son. Eyewitness accounts tell of the wailing and deep distress as they were forced from their home. When the ‘crowbar brigade’ began to demolish the house, the family ”became frantic with despair, throwing themselves to the ground; their terrifying cries resounding along the mountains for many miles”. It was said that ”those who witnessed their agony will never forget the sight”. This scene was repeated over and over again during the following few days. It was reported that the scenes were so harrowing that the policemen carrying out the evictions were moved to tears. In one house, an elderly man was repeatedly told by the sheriff to leave the house, and “the old man in doing so, kissed the walls of his house and each member of his family did the same”. There was no regard for individual circumstances – no mercy was shown to Rose Dermott, an orphan, whose house was levelled just the same as those of 3 of her close neighbours, although a brother and sister who were both deaf and dumb had their house spared. Such unimaginable terror was in itself bad enough, but the evicted families and their children had to find someplace to live. In the townland of Altnadogue for example, three Sweeney families with 18 children between them, were locked out of their homes. They moved to nearby Glendowan, away from Adair lands, and built sod houses for themselves. Hearing of the evictions, people in nearby Cloughaneely provided temporary shelter for some of the families. One family in Staghall, a man his wife and two children,were found to still be living in the ruins of their house some time later. The family had lived there for generations. A further group of five men were discovered huddled around a fire with no shelter as they were unwilling to move away. A month after the evictions, 14 families were still unaccounted for or were wandering through the ruins of their homes. Six families found shelter with or near to, relatives and friends, but 13 families had to take refuge in the Workhouse in Letterkenny. In the Workhouse it was reported that the Derryveagh people sat in a huddle weeping, and were so distressed that they were unable to eat. The elderly John Doherty of Castletown died only days after being admitted to the Workhouse and Michael Bradley is said to have gone insane. News of the evictions and the desperate plight of the dispossessed reached Irish people across the world. In Dublin, in France and in Australia money was collected. The Donegal Relief Committee assisted young people from Derryveagh in making new lives in Australia. 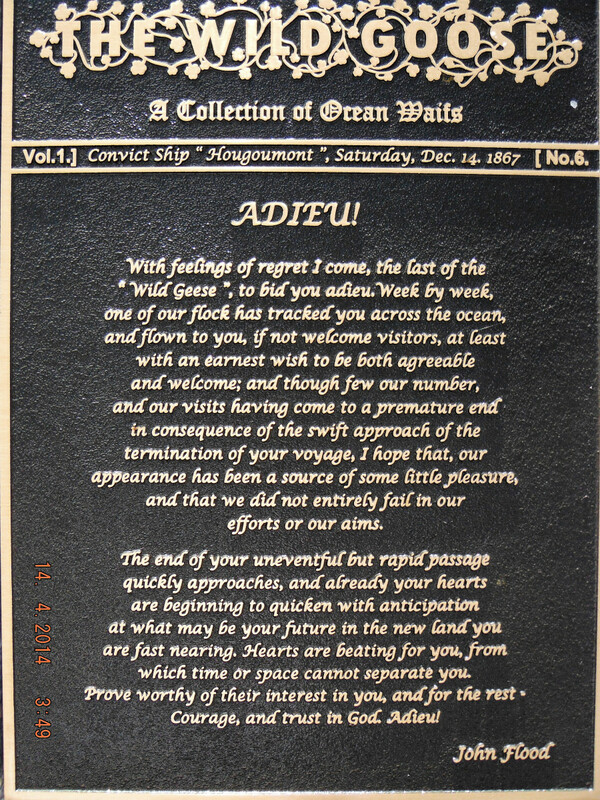 On January 18th 1862, emotional and heart-rending scenes once again broke the hearts of the people of Derryveagh as parents and friends bade farewell to 68 young men, 70 young women and a young married couple with their 2 small children, as they left Derryveagh forever on the long journey to Australia, probably never to return. 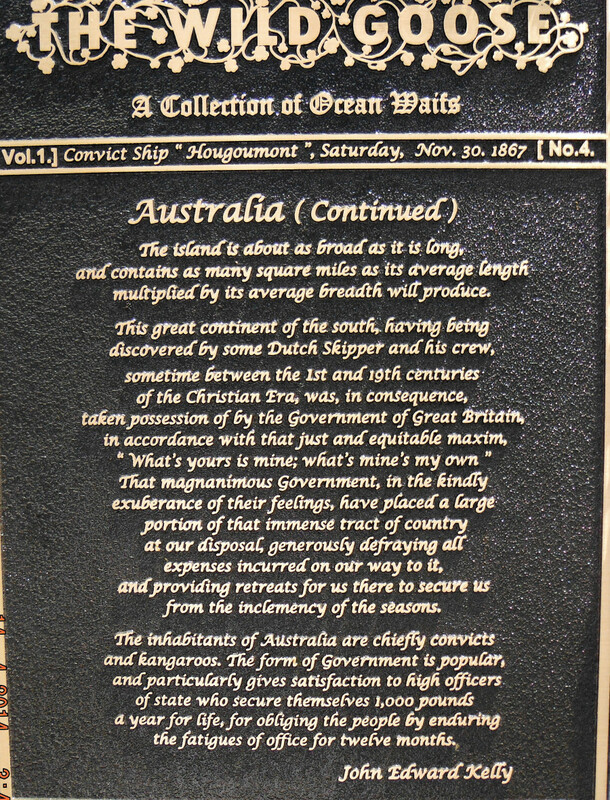 Over the next few years, many mostly young people emigrated from this locality – they headed to America, to Australia, to New Zealand.